Are right-leaning policies the price a nation must pay for maximising growth? The nanny state may be all nice and cuddly, but surely it’s not so good at growing wealth. Even the New Labour government behaved as though this was a given. But the answer is no. Over the long term, left-leaning nations have performed as well as right-leaning ones, if you are simply measuring economic growth. Left/right policies are not about how to grow the cake, but how it is divided. 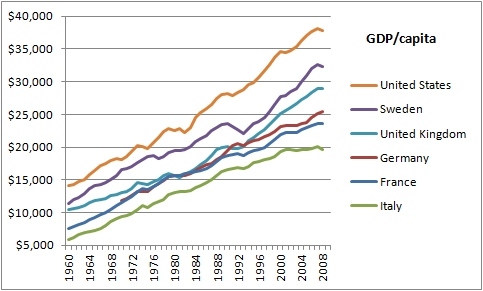 The exception is the US, where growth as measured by GDP does pull ahead of other large developed nations. But it’s not the whole story (see final paragraph). 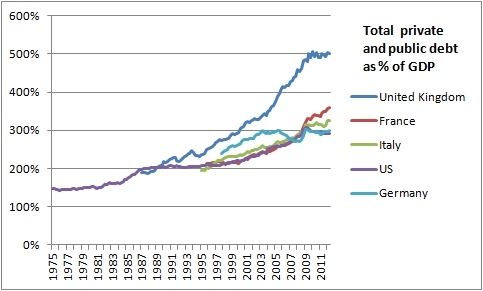 Before we go over those growth stats, let’s take a quick look at growing inequality in the UK. The “Gini coefficient” is an internationally used measure of inequality, where zero corresponds with perfect equality (where everyone has the same income) and 1 corresponds with perfect inequality (where one person has all the income, and everyone else has zero income). Gini doesn’t break down the details of precisely who is getting what. So what this graph doesn’t reveal is that since the mid-1990s (the flatter part of the graph) the very richest - the top 1% - have seen their incomes (before taxes and benefits have been taken into account) double, whilst the income of the bottom 90% has remained virtually unchanged. 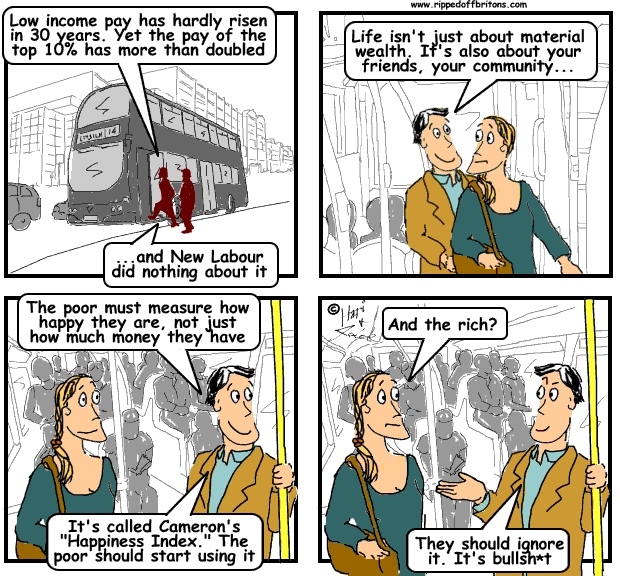 Yes, that all happened under New Labour. Finally, let’s look at the last few years under the Tory/LibDems. Surely the worst recession since the 1930s has put a brake on the runaway pay of our captains of industry. Dream on. The Manifest/MM&K Executive Director Total Remuneration Survey for 2012 showed bosses of FTSE 100 companies enjoyed an average 12% rise in their take home pay last year, while their employees barely received any pay increases at all. Even when growth is zero the richest are getting more cake. The big question: do right-leaning policies outperform left-leaning ones? 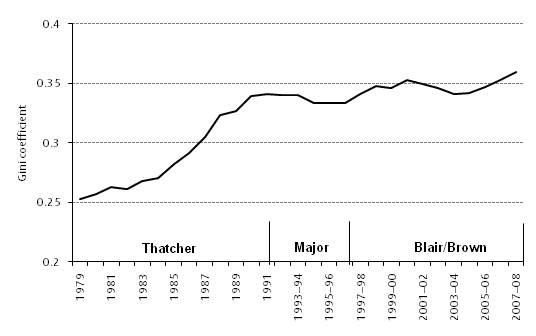 Different nations comparable to the UK, both left and right, have grown at roughly the same rate over the last 50 years. I’ve included little Sweden because it is taken as a role model for a strong welfare state. The US – a model for right-leaning policies – is pulling away from the rest when measuring GDP/capita in constant US$ (although it is followed by nanny state Sweden). But when you measure it in Purchasing Power Parity (PPP: where the cost of living is factored in, i.e. it adjusts for the fact that $1,000 buys less in one country than it does in another), then all the Europeans – both left and right – are doing the same. The US is gently pulling ahead – we’ll look at that at the end. Is left-leaning growth boosted by debt: borrowing from the future to keep up with the rest? Here’s a graph for those of you who think those centre and leftist governments have been pumping up their GDP figures by borrowing from future generations. Left-leaning nations may take on more government debt than right-leaning ones, but to get the true measure of a nation’s debt you have to include all private debt, not just government debt. Do that, and the US, France, Germany and Italy are all clumped together. Private debt includes debt owed by households, businesses and banks, and it makes up the majority of total national debt for these nations. And who has been the most naughty in over-borrowing to fuel growth? It’s fat cat Britain, under both left and right governments, where most of it has been private debt: as of today, UK private debt is four times government debt. In other words, of total UK debt, the breakdown is: government debt=19%; household=19%; non-financial corporations=22%; financial corporations=40%. Too many politicians and commentators quote only government debt, without mentioning the much greater private debt that all countries have. But both matter: if your banks, partner businesses and millions of your customers are in deep debt then you will have to deal with it just as you’ll have to deal with government debt. You’ll have noticed that all countries have been borrowing more and more over the last few decades. Funny, eh? During the late 20th century face-off between state control and liberal capitalism, the winner by a knockout was liberal capitalism. What happened next? Alone and unchallenged in the middle of the ring, liberal capitalism somehow managed to knock itself out. The right cannot pour scorn on the left for taking on perilous amounts of government debt when its own solution is to do the same with private debt. If debt has been used to fuel growth, it’s been used by both right and left. 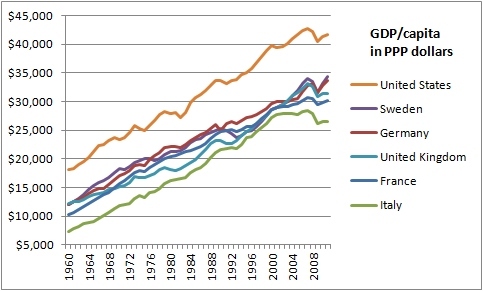 How come the US is richer, and getting slowly richer still? 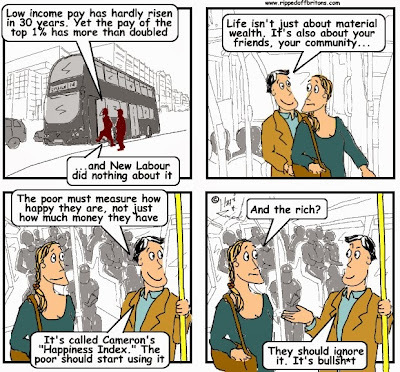 Do they prove that unbridled capitalism - the sort no European dare try – really works? As everyone knows, the Americans typically get only two weeks holiday a year. That alone can account for between 10% (the UK) and 20% (Germany) of the difference. 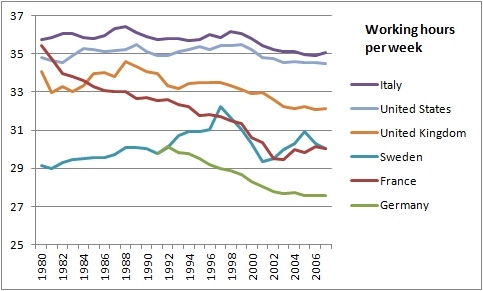 Note how a graph of the working hours per week across our sample countries shows how since the 1980s France, Germany and the UK are spending less time in the workplace than the US. So one reason the US is pulling away is because they are working longer hours – hardly a miracle of the free market! If we want to get closer to American GDP/capita or PPP/capita, one way is for our great leaders to apply their brilliant minds to the problem and... force everyone to stay at work for longer. “Our gross national product...if we should judge the United States of America by that - counts air pollution and cigarette advertising, and ambulances to clear our highways of carnage. It counts special locks for our doors and the jails for those who break them. It counts the destruction of our redwoods and the loss of our natural wonder in chaotic sprawl. It counts napalm and the cost of a nuclear warhead, and armored cars for police who fight riots in our streets. It counts Whitman's rifle and Speck's knife, and the television programs which glorify violence in order to sell toys to our children. So next time you hear a new policy that shifts the burden of cost from one group to another, claiming it’ll improve the prospects of the UK as a whole, then beware. Over the long term, left- and right-leaning nations perform much the same. The difference is in the distribution of those costs and the distribution of the wealth it creates. In other words, it’s about how the cake is divided. However interesting, you have not provided any evidence to show that left/right policies grow the cake equally, as you've only compared two right-wing systems: Free-market capitalism and social-democratic capitalism. If you want to compare a left-wing with a right-wing system, I would suggest the USSR-VS-USA debate, even if the USSR was a degenerated workers' state and not socialist. I would even go as far to provide you with some sources, and I would love to see what you would make of it as I believe your articles are of a very high standard. Genuine thanks for the compliment. I'm afraid we're busy rising to other challenges, so I don't see us taking up this one. I was careful to use the term "left-leaning" rather than socialist, but I take your point. From memory, "communist" countries grew as fast as capitalist ones in the 1950s and 60s, but after that their growth stagnated. But I think a more interesting and relevant debate would be: since the 1990s has capitalism been sustained by little more than greater and greater debt? Indeed, and what about compounded fractional deposit lending? Surely, that makes a mockery of growth? Just looking at debt/cost without looking at asset/benefits is only part of the story. The breakdown of net assets from richest to poorest shows that money isn't neutral. Distribution matters. Anonymous Mitch, even taking into account failed left state capitalism, the successes of China,Norway and Singapore-who owns most of the land and buildings-show that mixed economies outperfrom more extreme capitalist ones like the US. Anonymous Mitch; the USSR was such a failure that on it's demise life expectancy sank and death rates soared...so their health care had much better value for money outcomes.